Recently I had the opportunity to do some freelance film inspection at Hood College in Frederick, Maryland. Having gone to high school in Frederick County, my junior and senior year prom dances were all held at this small, picturesque city campus. I never really got to know much about this historic college other than it used to be an all-female college until the 1970s, so my few days’ work was particularly interesting. There is nothing like learning about a place or person for which you have a solid image in your mind, only which seems to morph into unexpected depths the more you learn about them. The majority of the audiovisual items in the Hood College archives are 16mm film, although there was also a strong presence of video and audiotape in the stacks. My assessment focused only on the 16mm and Super 8mm film items, but one exception was partially made for a nitrate 35mm film in the collection. The exception was made because, A.) I wanted to confirm whether it was nitrate or not, and B.) it was relatively easy to figure this out (I just took a quick look wearing gloves, and there was the word “NITRATE” along the film’s edge). 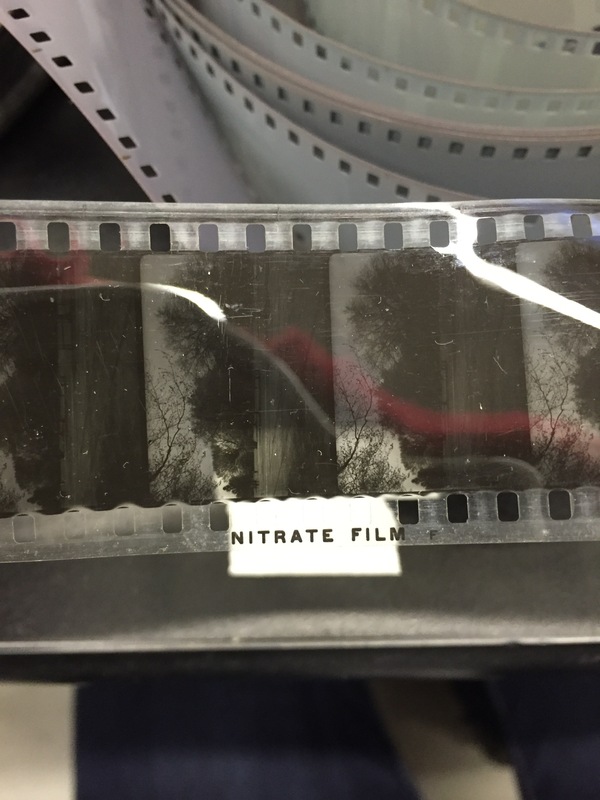 Now that Hood knows that it has a nitrate film, it can take the necessary safe-guards when storing and handling it (see more about this here), and they can put it at the top of their preservation priority list. After researching the information I had collected from the film container and leader, this should be footage from May 1950 when the Begum Linquat Ali Khan (wife of Pakistan’s then Prime Minister) visited Hood College as arranged by Hood’s head of the Economics and Sociology Departments, Dr. Olive Reddick. Portions of this film were more than likely used in the making of another film I found in the collection entitled, “A Family Enterprise”. A 1951 newspaper article clipping was found in a film container describing “A Family Enterprise” as a “sound and color movie which tells the Hood College story”, and mentions the nitrate footage of the Begum as well as notable “Fredericktonians” who make cameos in the film. There were two other titled Hood College promotional films found in the collection. “Gateway to Learning” (circa 1958) had two versions: one for fundraising and one for student promotion. While the student promotional version is three times as long as the fundraising one, they both include footage of students and campus events at the current time of shooting and through the years, as well as an interview with the then-President of the college, Dr. Truxal. A similar film was made for the same purposes in 1968 titled, “To the Future with Confidence”, which is particularly interesting knowing that only a few years later Hood began to allow male students to enroll at the school (1971 to be exact). 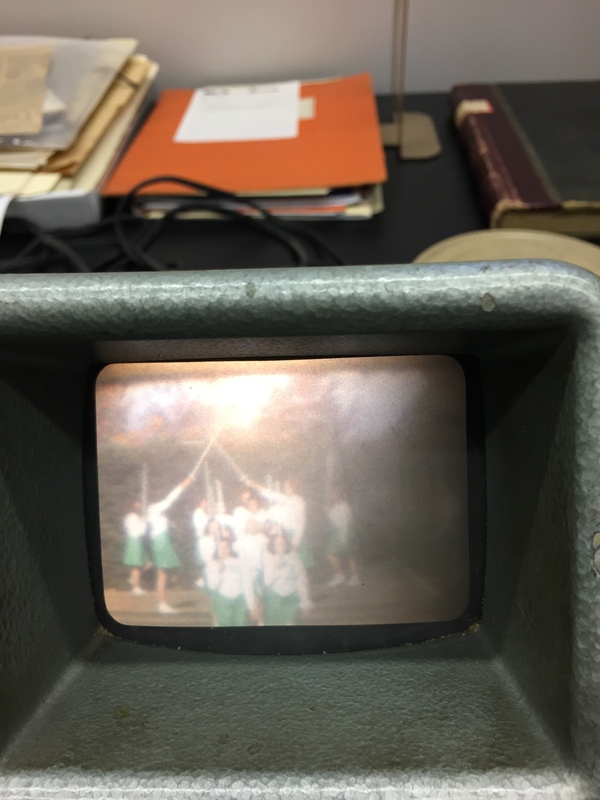 Much of the film collection was amateur shot, home-movie-esque footage of the campus and student events. It was great to see the traditions of the school carried over from year to year, decade to decade–particularly the beautiful color footage of several years of their May Day celebrations and graduation activities. There was also a lot of raw footage of the campus’ surrounding areas–which was particularly fun for me to see how the City of Frederick has changed over the years. And lastly, probably my favorite film was “Making the Most of Your Library”, made by the librarians of Hood College in 1945 to promote and explain how to use this fine establishment. In it, two students are assigned a paper in class; one girl goes to the library, one does not. The savvy, library-going student finishes her paper in record time, and is therefore able to go out on a double date. The other student is left clueless and alone in her room all night trying to figure out what to write. As a librarian who works in a university library myself, I personally cannot wait to see this movie digitized and preserved for future library-goers! 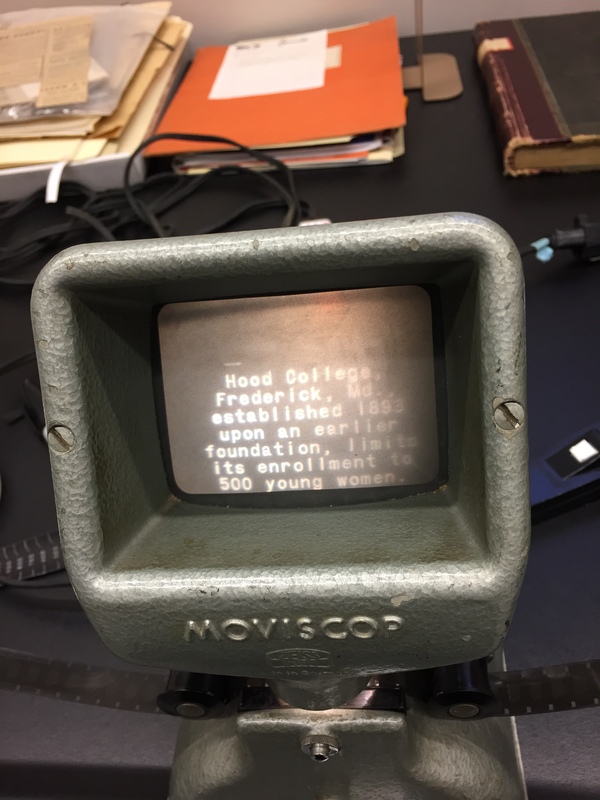 Overall, Hood College’s small moving image archive is a unique treasure trove of the school’s history as well as of the surrounding geographic region. I am looking forward to see how the collection is preserved and used in the near future (especially that library movie), and hope to have an update for readers some day.